Click the Sync With BigCommerce button. 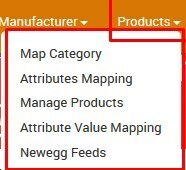 Select the checkboxes associated with the required fields. The Sync store products page appears as shown in the following figure: The Products synchronization with the store is executed and the status appears. The products are synchronized from the store to the App. Note: If there is an error in the product synchronization process, then it appears on the page. Otherwise, a success message appears with the process status.